standards of safety and comfort. 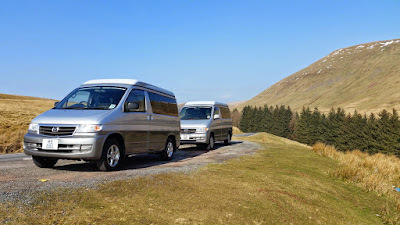 Unlike larger motorhomes our Bongos are simple to drive and park, and will take you to some of the hidden places which make a holiday in Britain's great outdoors so special. Excellent Mazda engineering gives the reliability you need for a carefree vacation, while clever features including electric window blinds, and a power-lift roof that goes up at the touch of a button, will give your holiday that extra touch of luxury. Both vans now include gas cooking hobs and 12 volt electric fridge/cool-box, so are suitable for use at festivals and other "off-mains" pitches. However, we still recommend using mains electric hook-ups where possible, so that you can take advantage of the microwave oven, and any other 240 volt appliances, including our special warmer nights pack for cosy spring or autumn breaks. Alternatively, consult the comparison table below and then go onto the details page for the van which best suits your needs. Whichever option you choose be sure to book early to secure your selected dates as demand for both vans is expected to be high again this year. A choice of two luxury vans from our hire base in Blackwood, near Cardiff South Wales.